The average cost of memory care in Saint Johns County is $4,027 per month. This is lower than the national median of $4,650. Cheaper nearby regions include Clay County with an average starting cost of $2,597. To help you with your search, browse the 5 reviews below for memory care facilities in Saint Johns County. On average, consumers rate memory care in Saint Johns County 4.8 out of 5 stars. Caring.com has helped thousands of families find high-quality senior care. To speak with one of our Family Advisors about memory care options and costs in Saint Johns County, call (855) 863-8283. Saint Johns County has a population of 385,571 within its borders on the Atlantic coast of Florida, just south of Jacksonville. An estimated 96,000 of those people are aged 65 and older, and ten percent of them are likely to be living with dementia. By the year 2025, the Alzheimer's Association is projecting the number of people in Florida with cognitive ailments will swell from 540,000 to 720,000, and demand for care will require more treatment facilities, or extended congregate care facilities (ECCs), as they are called in Florida. The Florida Agency for Health Care Administration is responsible for licensing and regulating these facilities. There are about 33 ECCs near Saint John's County, with the vast majority of them being in Jacksonville and Jacksonville Beach. Saint Johns County receives 51 inches of rain per year, which is 12 more than an average U.S. city at 39. Its average of 224 sunny days yearly is 19 more than the national average of 205. Seniors' health may benefit from the balmy weather since winter lows only drop to 44 degrees, and summer highs just reach 91. Saint Johns County was awarded a 77 out of 100 in Sperling's Comfort Index. The violent crime rate is almost even with the U.S. average of 31.1 at 30.4. This is based on a 100 point scale with one being the least dangerous. The national average for property crime is 38.1, while Saint Johns County's is 32.3. Families may want to check into what security measures a prospective ECC has in place. Saint Johns County is home to world-class medical facilities, including those specializing in brain health and dementia care, such as Flagler Hospital and Jakadofski Campus of Flagler Hospital, in the event of a medical emergency or illness. Florida has no state income tax, so seniors and family members may find that their budgets stretch farther in Saint Johns County. This can be especially important to those on a fixed income. Any extra funds can be spent on healthcare costs in an ECC. Memory Care costs in Saint Johns County start around $4,027 per month on average, while the nationwide average cost of memory care is $4,799 per month. It’s important to note that memory care rates in Saint Johns County and the surrounding suburbs can vary widely based on factors such as location, the level of care needed, apartment size and the types of amenities offered at each community. Learn more about these programs, plus who’s eligible, on our Memory Care in Florida page. For more information about different ways to finance memory care, visit our Memory Care in Florida page. Saint Johns County and the surrounding area are home to numerous government agencies and non-profit organizations offering help for seniors searching for or currently residing in an assisted living community. These organizations can also provide assistance in a number of other eldercare services such as geriatric care management, elder law advice, estate planning, finding home care and health and wellness programs. To see a list of free memory care resources in Saint Johns County, please visit our Assisted Living in Florida page. 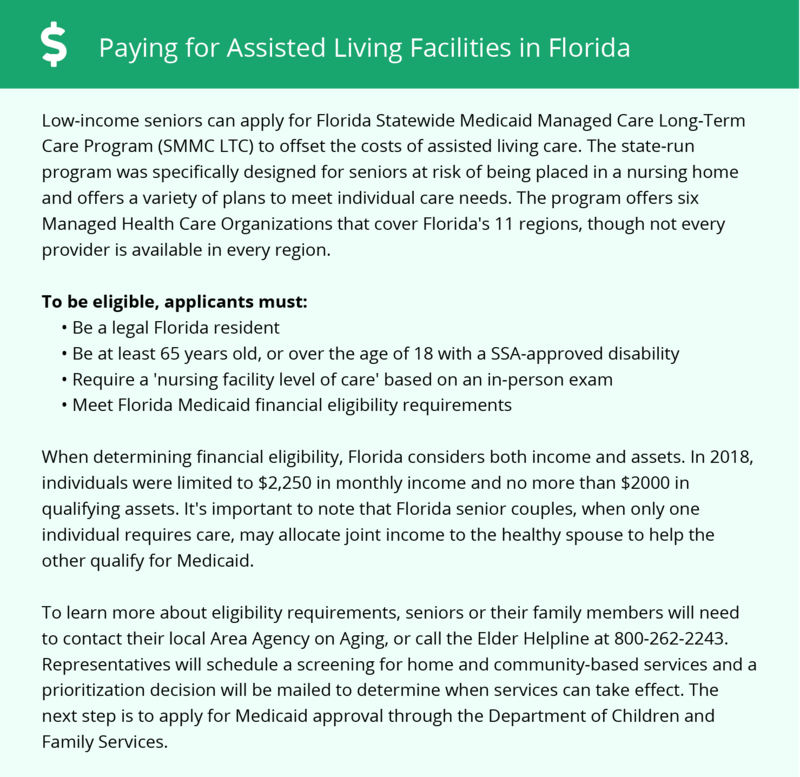 Saint Johns County-area assisted living communities must adhere to the comprehensive set of state laws and regulations that all assisted living communities in Florida are required to follow. Visit our Memory Care in Florida page for more information about these laws.